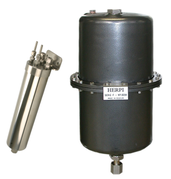 Mechatest delivers sample coolers that fits your needs for liquid and gas sampling applications. Liquid and gas analysers need a sample in a specific temperature range, when this temperature is different from your process temperature, a sample cooler can be required. 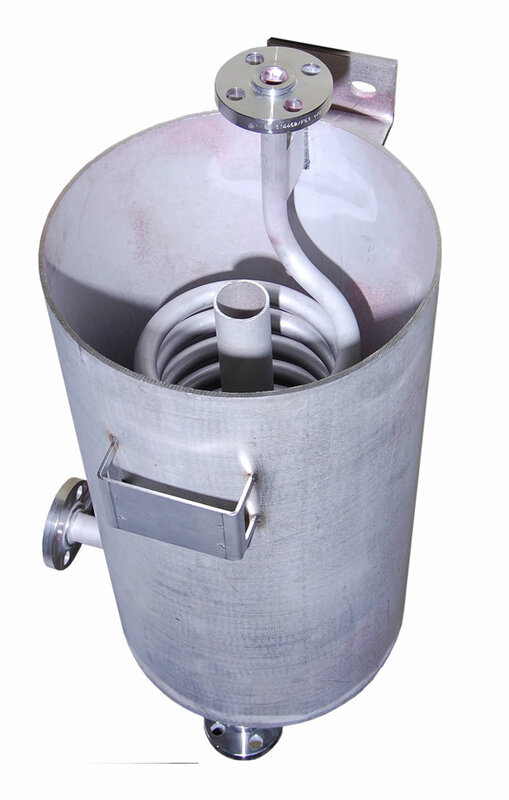 We are manufacturer of a width range of Stainless Steel and Alloy sample coolers, we are also Herpi coolers stock distributor and have partnership with Sentry. 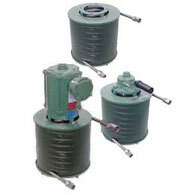 We deliver water coolers and electrical compressor coolers for gas and CEMS applications. 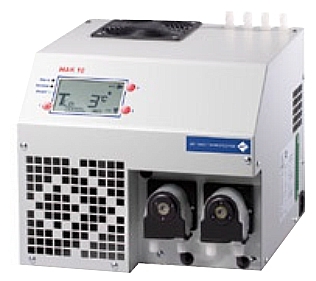 With sample coolers you can bring down the fluid sample temperature in a sampling system for optimal conditions to the analyser accordingly to ASME PTC 19.11. Applications in hot water sampling, Steam cycle for Makeup, Condensate, Deaerator, Boiler feedwater, Saturated steam, Main steam, Reheat steam, Superheated steam and Hydrocarbon fluids. Innovative sample cooling systems combined with expert sampling knowledge and fast distribution by Mechatest, an excellent combination. This helical coil (tube) sample coolers require a continuously cooling water flow, if you not have cooling water at your plant side ask for our solution with a "passive sample cooler". The helical coil cooler (heat exchangers) cools a sample from a process stream. 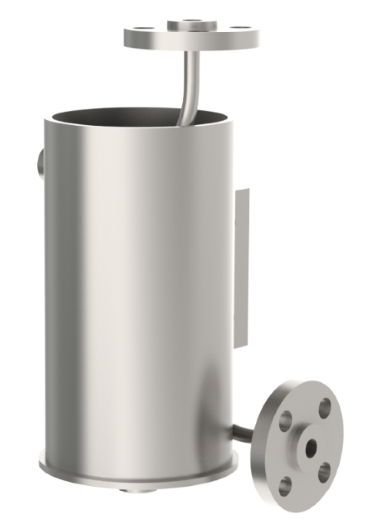 Typical design with spiral small diameter tube and shell heat exchanger accordingly to ASME PTC 19.11. The sample to be cooled flows through the tube side of the cooler, and the cooling fluid flows through the shell side. 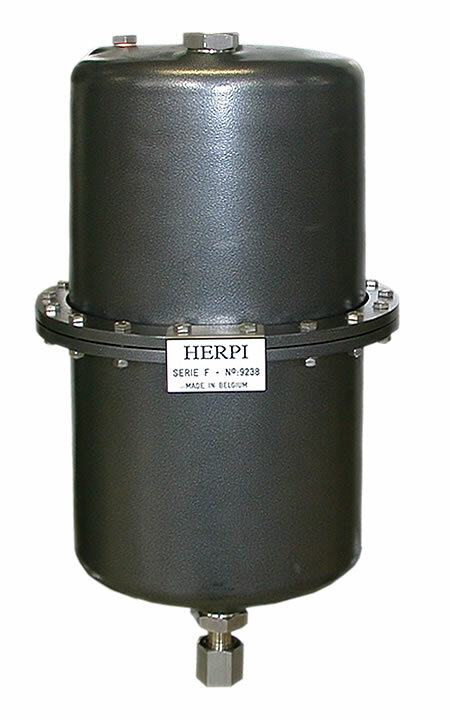 We offer Mechatest, Herpi and Sentry helical coil coolers. Applications to max. 540°C (higher on request). 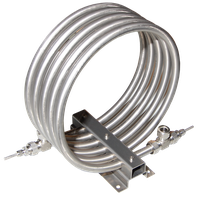 Available with coils in Inconel, Monel or other Alloys for high Chloride content cooling water or high chemical samples. 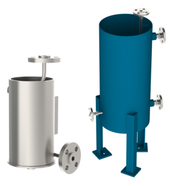 Tube-in-tube cooler (heat exchangers) are spirally wound, full counter flow heat exchangers well suited for a variety of applications where low flow rates of high temperature and/or high pressure fluids need cooling or heating. Also known as DTC (dual tube coil). 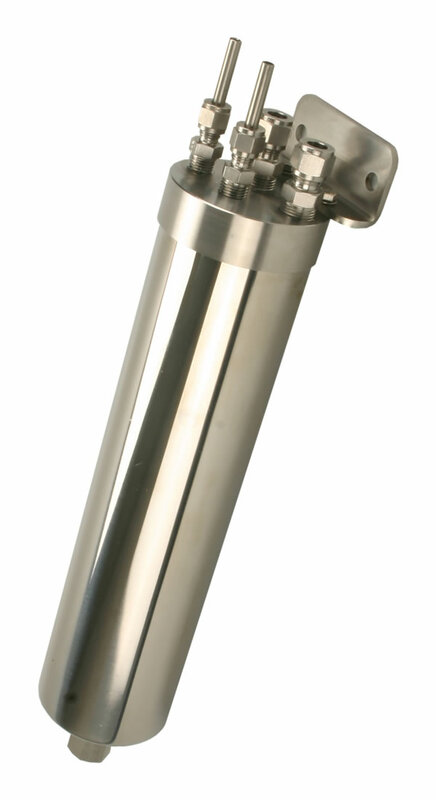 We offer Mechatest and Sentry tube-in-tube coolers. The "open" helical tube cooler (heat exchangers) cools a sample from a process stream. Typical custom design with spiral bigger diameter tube or pipe and open shell heat exchanger. The sample to be cooled high flows through the tube side of the cooler, and the cooling fluid flows through the shell side. 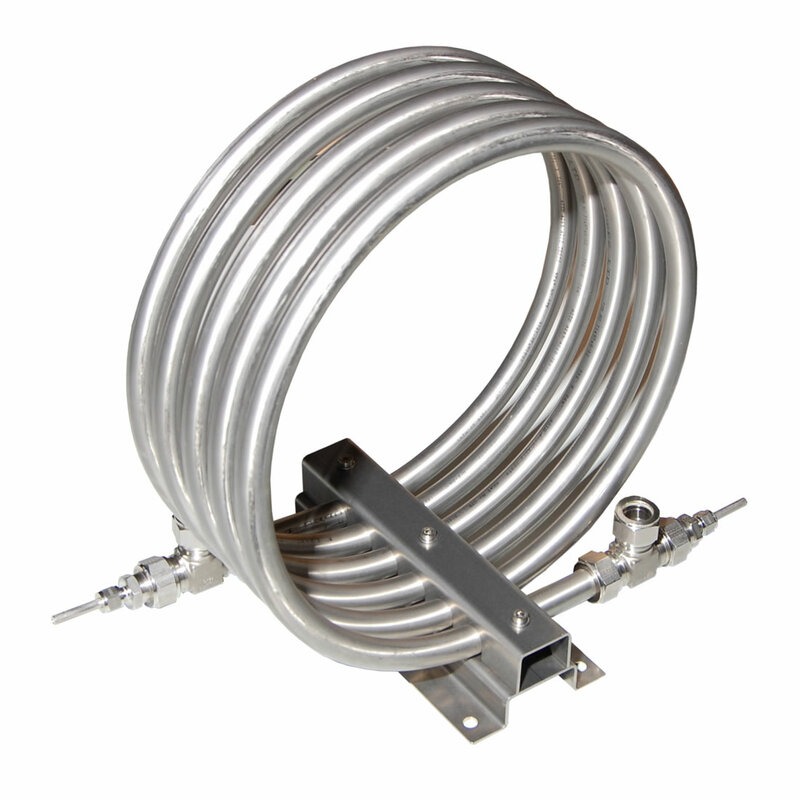 We offer Mechatest open type helical tube coolers. The Airfin cooler is available in natural convection and forced air fin designs with a cooling area of 2.5 m² (26.8 ft²). Lower operating costs ensured by air-cooling technology that eliminates water treatment and disposal. Improved reliability with cooling water-free design, which prevents accidental shutoff and winter freeze-up. Minimal installation and maintenance costs with unit design that requires less piping and is less susceptible to fouling. 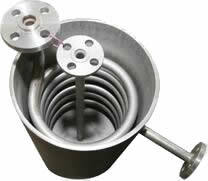 The helical coil water cooler (heat exchangers) cools a sample from a process stream. Typical custom design with spiral big diameter tube or pipe and open shell heat exchanger. electrical compressor cooling system, typical refrigerated and thermoelectric coolers for highest demands of sample gas quality control. For dry gas analyser applications with dewpoint to 5 °C. 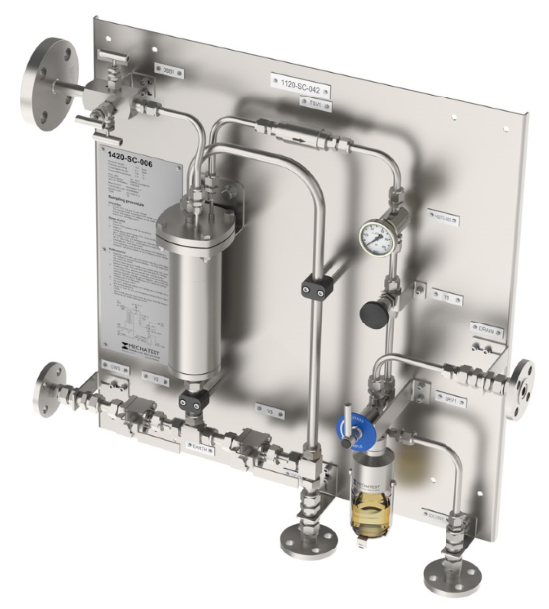 This is the best choice for permanent separation of the condensate from the gas phase, as well shorter contact time of the gas in the system, play important roles to measure extreme low concentrations of gas elements. water cooling for demands of sample gas quality control. For dry gas analyser applications with dewpoint up to the cooling water temperature. Liquid cooled gas cooler is an alternative choice if electrical cooling cannot fit, permanent separation of the condensate from the gas phase, as well shorter contact time of the gas in the system, play important roles to measure extreme low concentrations of gas elements.